Iran, Jan. 7, 2019 - On Sunday, hundreds of employees of the Agriculture Insurance Fund from across the country gathered in Tehran and demonstrated in front of the building of the Recruitment Organization. The employees were protesting for not having job security and are demanding to be officially hired. These workers had previously held similar demonstrations. The Insurance Fund workers were chanting, “We are all unemployed because we don’t have good genes,” a reference to people who get work and financial privileges because of their family ties to regime officials. “Our problem is right here, [the government] is lying that it’s in the U.S.,” the employees were chanting. The Iranian regime has tried to lay the blame for the country’s economic problems on U.S. sanctions and other foreign states. But as far as the people are concerned, the real root of the problem is the corruption that is plaguing the entirety of the regime. “If embezzlement cases reduce, our problems will be solved” was also among the slogans of the workers, a reference to the state-run embezzlement cases that have swindled billions of dollars out of the pockets of the Iranian people. The demonstrators were protesting against the meager social and financial rights that the government allocates to disabled people. According to reports, the credit allocated to disabled people in the new government budget is much less than the disabled people’s minimum needs. 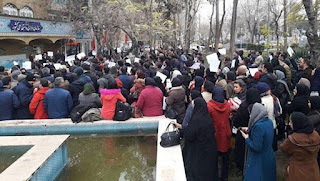 The workers of Vahdat Financial Institution held a demonstration in Mashhad in front of the governor’s office in protest to being fired from their jobs. Vahdat was among several state-backed institutions involved in a large fraud scam that stole billions of dollars from Iranian investors. Last year, after being dissolved by the Central Bank, Vahdat was merged into Melal Financial Institution. Since then, the employees of Vahdat have been under constant pressure and threat of losing their jobs. Melal fired a large number of Vahdat employees after processing the debts of the disbanded institution. 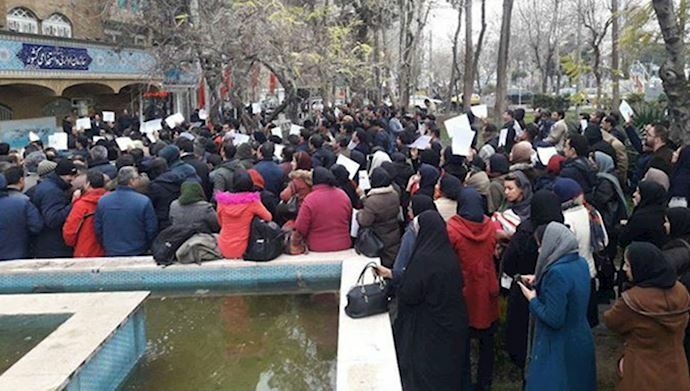 In recent days, the employees of Vahdat in other cities have held similar protests. A group of retired workers from Haft Tapeh sugar factory, Khuzestan province, gathered in front of the factory manager’s office on Sunday and protested against the lack of payment of their yearly salaries. The retired workers held similar protests on Saturday. According to reports, these retired workers, whose numbers amount to 95, have retired between November 2016 and February 2017 and haven’t received their overdue salaries since. On Sunday, a group of bakery workers in Tabas, Khorasan province, demonstrated against their poor living and working conditions. The workers, whose wages haven’t raised since 2014, say that in 2019, they can’t live with 2014 wages. Since 2014, the costs of living have increased several fold in Iran. The workers say that the freezing of the salaries of bakery workers have caused various problems. “Officials can’t expect workers to be able to pay for the expenses of their lives and not protest,” the workers were saying.